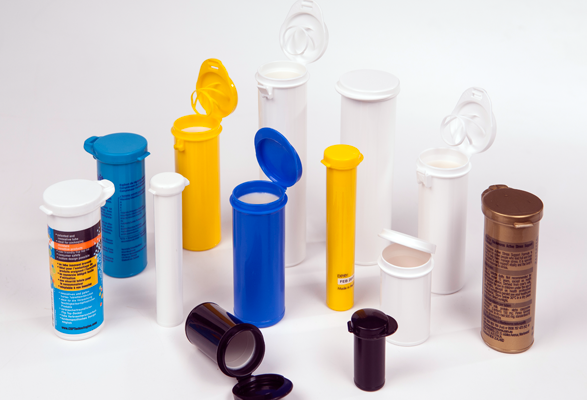 Desiccant Vials are certainly a unique and highly elegant form of sterile packaging for moisture sensitive tablets, test-strips, and test-kit components. First of all, a twin-shot moulding of structural plastic forms the outside. Furthermore, a patented desiccant plastic forms the inside. As a result, the two form an inseparable bond. Therefore the desiccant (Molecular Sieve or Silica Gel based) cannot be lost, removed, or ingested. This award-winning product can be manufactured to suit your products specific shelf-life and opening frequency needs. Hence, you have total peace-of-mind that your product will ‘arrive alive’ when used by your customers. It’s also totally customisable in terms of size, colour or closures. Even more, the Desiccant Vials can be provided as a blank tube or with your printed label already on the outside. For help with your Desiccant Vials requirements or any other problems that you have, please give us a call on +44 (0)1628 531900.